The Dry Season is back and it’s time for the first music festival of the year! SEASIDE SOUNDS. DARUDE: Famed for the global platinum-selling smash ‘Sandstorm’, Darude is recognised by many as one of the most influential artists to emerge from the dance scene in the past decade. With a DJ style that is a mixture of progressive and uplifting trance, fused with elements of tech, breaks and house, Darude’s music delivers a dynamic energy that gets any dancefloor moving. Having established himself as DJ for the people, continually wowed club crowds around the world and released some of the biggest dance anthems ever produced, it is a testament to his popularity that he remains one of the scenes most in demand artists. TIGERLILY: Undeniably captivating from the moment she enters the room, Tigerlily’s electrifying stage presence and drive to transcend the traditional expectations of a DJ sees her in a league of her own. A true entertainer taking the world by storm. Tigerlily finds herself among Australia’s elite performers with the public voting her in the top 5 DJs for both 2014 and 2015 and the #1 female DJ three years running (via Inthemix). With the world at her feet and #TeamTiger at her back, Tigerlily has proven herself as one of the Powerhouses of the Australian music industry, creating a global social movement full of music, happiness and positivity that is felt the world over. POTBELLEEZ DJS: One of Australia’s most successful and legendary Dance duos, POTBELLEEZ DJs (Dave Goode and Jonny Sonic) have remained one of the Australia most in-demand and electrifying DJ acts. Their no holds barred rocking driving Big Room house sets have seen them performing on some of the biggest Festival stages worldwide. As the Potbelleez they have sold over 750,000 singles and albums in Australia alone and are known for some of the biggest dance tracks over the past few years including Hello, From The Music, Are You With Me, Saved In A Bottle and the triple platinum, top 5 single, Don’t Hold Back. CHRIS ROYAL: With his signature bass sound which has captured the attention of the music industry and clubland at large, Royal prides himself on playing for the crowd - a crowd that is always strong in numbers and brimming with enthusiasts keen to hear his heavy bass lines. His label, Royalty Records, a record label pioneered by Royal himself, has recently launched, and is receiving an overwhelmingly positive response. The label aims at sourcing previously un-earthed artists, giving them a platform to launch from and since signing to Jump Touring, Royal has hit the ground running, mastering his unique sound and generating interest internationally, with industry legend Krafty Kuts among many industry insiders tipping him as one to watch. DJ BLISS: The undisputed queen of diversity, Bliss’s blend of Electronic Dance, Trap, RNB, and Hip-Hop, is delivered with an explosive energy that beckons crowd participation. Renowned for delivering highly energetic ‘party sets’ and dance anthems, as well as being able to lay down the freshest house sounds, Bliss has solidified her career with a reputation to boot. This is backed up by cracking the world top 100 DJ JANE list at #84 and #7 in Australia in 2017. FALSE RUMOURS: One of Darwin’s hottest local acts, forging a name for himself in the studio and with performances not to be missed! Fresh off taking out the runner up spot in the INDABAMUSIC remix competition of Simone’s track DAYDREAMS, False Rumours comes at SEASIDE SOUNDS with impeccable taste and tune selection plus a few surprises up his sleeve to boot! ¹ VIP TICKETS Include access to Exclusive Area with own Bar, beanbags, shade and open pool, plus 4 drinks of your choice. - The Promoter reserves the right to change the line-up and/or the date of the event without prior notification. In the event of a change of the date or lineup, refunds will not be available. - No BYO alcohol, soft drinks, juice, milk, energy drinks, flavoured water or sports water is permitted. - Sealed plastic water bottle or an empty plastic water bottle is permitted. - Any person over 18 is free to enter and exit the venue as you please as long as your wristband stays intact. 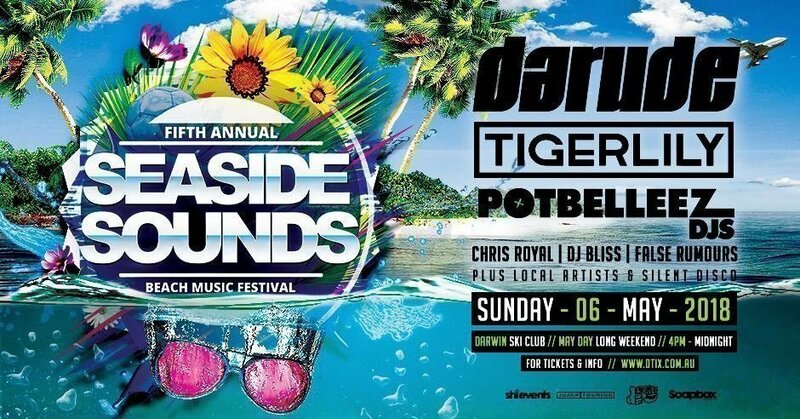 - Lost property will be kept at the box office throughout the event and will be held at Monsoons (46 Mitchell St, Darwin) for three days before being taken to the Mitchell Street Police Station. No responsibility is accepted by the Promoter for property. - PLEASE NOTE: Only the first scan of each ticket will allow entry to the festival. Duplicate ticket holders will be refused entry to the festival. - Do not purchase tickets from unknown parties - they may not be legitimate.